My wife had a spill on the electric cook top stove. She cleaned that out fine. 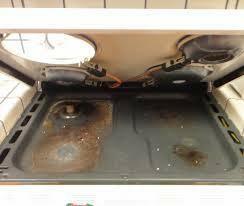 But some of the spill actually spilled over the sides and got underneath the cook top and it started to stink. Is there any way to get access and clean underneath the cooktop? Please, your help would be greatly appreciated. You should be able to lift up the entire cooktop and prop it open. Try this. Yep. Like the photo. 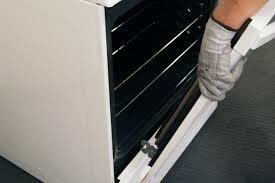 Keep in mind too that most stoves have an oven door you can also lift off the hinges as long as it's just open to the first catch. Again, the photos help.